Imagine your students interacting with your content through an Interactive Notebook- but... NO copying, cutting, coloring, or gluing! 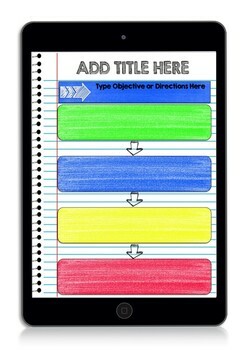 Instead of traditional Interactive Notebooks, try going digital with PAPERLESS notebooks! Digital Interactive Notebooks have all the benefits of traditional paper Interactive Notebooks- with NO PAPER! These templates and graphic organizers are created in PowerPoint and are a perfect starting point for creating your own notebook pages on Google Slides. These work seamlessly with Google Classroom and Google Drive. This product is a sample from my larger products, each with over 100 templates! OR you can SAVE by purchasing the BUNDLE that includes all 3 Packets with over 300 Templates! Go to your My Purchases page. Beside each purchase you'll see a Provide Feedback button. Simply click it and you will be taken to a page where you can give a quick rating and leave a short comment for the product. I greatly appreciate customer feedback so that I can continue to make useful resources for you! Also, be the first to know about new products, sales, and FREEBIES from Chalkboard Creations! Click on the GREEN STAR near the top of the page and to become a FOLLOWER!